Foodie beware: one must prepare mentally and physically for a visit to the world’s capital city. I never tire of being a repeat visitor of London and with family there I make sure to frequent its cobbled streets whenever watch [and wallet] permit. Don’t believe the gossip- London offers whatever sweet, savory or salty food your palette could dream up and if you’re hoping for guidance, you’ve come to the right place. Don’t sweat the calories- I averaged a walk of about 10 miles daily and imagine you will do the same quite easily. It’s a city that begs exploration by foot but also hosts a quite navigable transportation system. I recommend strolling and letting the wanderlust guide you to your own food destinations. This is how I’ve found my favorite spots. If you wander the area surrounding Southward Bridge you might eventually turn your gaze upward and be drawn towards the ancient dome of St. Paul’s. You might smell the sweet-laced yeast of French crêpes rising from a 5×5 striped tent and lose control of your salivary glands like I did. The quaint pop-up coupled with the charming hand-written a-frame menu highlights the authenticity and the French natives pouring the batter as you watch completes the mood. Choices range from sweet to salty, but the La Goaty’s onion chutney offered a slightly unusual add-on that reeled me in. 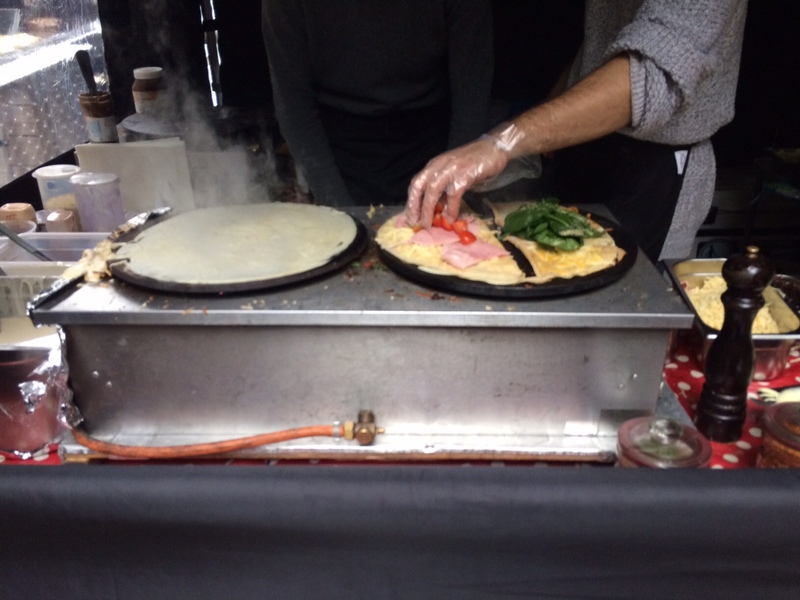 After cooking the meal, the vendor folds the crêpe into a paper plate and thirds it neatly into a portable cone that makes it the perfect food for grab & go fare. As usual, I couldn’t wait to sit down to try a bite. The flesh of the pancake was pleasantly crisp with the sweetness of real butter used to lubricate the simplistic griddle. The meal married the tangy twinge of goat’s cheese with a faintly bitter but undeniably sweet onion chutney and the spinach soaked in both flavors perfectly. I took my meal to the stone seating area steps from St. Paul’s and watched as the pigeons stayed near hoping for a fallen morsel. Yummmmy ….I can almost smell the foods and hear the footsteps through the city.. Thanks, Kerri! It’s making me relive the flavors in memory but it’s not enough! Time to go back now and relive and breathe the experience….